The staff filed complaints at the department after being left in the lurch following the companys closure. 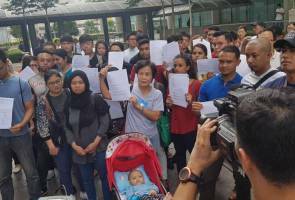 SUBANG JAYA: More than 50 former True Fitness Malaysia staff today sought justice at the Labour Department after the fitness centre closed its operation here. The staff filed complaints at the department after being left in the lurch following the company’s closure. “We, the former staff of True Fitness Malaysia, are disappointed and saddened with the unethical and shameful way the company treated us. We were left in the lurch after the sudden closure of the company, leaving us jobless. “Like any other Malaysians, we have our commitments to fulfill and it is unfair to us to be left in the dark like this. We were not notified of the closure and only received a text from the management, thanking us for our service and asking us to not turn up to work anymore as our service is no longer required. “What is more shocking is the fact that we may not be receiving any sort of financial compensation due to us in accordance with the Malaysia Labour Law. “We have to put food on the table and have bills to pay as well,” they said in a joint statement today. The staff also plan to lodge police report over the unjust treatment and hope the Human Resources ministry will offer a helping hand. True Fitness and True Spa centres in Malaysia have ceased operations on June 10. In a statement released on its website, the fitness centre outlets which have been serving fitness enthusiasts in the country for the past 12 years, said the closure is due the business not being financially viable. Attempts to contact the True Fitness’ head office in Singapore were futile.